I know a bunch of people who have run marathons. I know even more people who have run a marathon. And of that latter group I know a lot of people who seem unlikely to ever run another. My personal belief is that a lot of the people in that last group are there because they have had bad experiences with the training. For them every single long run was agony, and the race was worse. They talk with pride about accomplishing the goal of crossing that finish line, but they also talk about how painful it was to get there. I have nothing but admiration for the courage and grit of anyone who recognizes themselves in that last sentence. But I feel sad that there are so many people who run that one marathon, and never want to run another. This got me thinking about how I might avoid that fate myself. It seemed obvious to me that the fault lies not in the people, but in the training. And perhaps in the expectations as well. When one looks at it from a distance, the very premise does seem somewhat absurd. Take someone who has, at best, run 13.1 miles, and double their range in approximately four months. And send someone into an endurance contest without ever having accomplished more than 3/4 of what that contest demands of them. That sounds like a lot of hard work. And it sounds like lining up on race day with a lot of potential doubts in one head. I chose a very different route for myself. I can't recommend this to others, but it seems to be working for me. First off, I set myself a goal, but not a timeline. I decided that I would go and run a marathon when I had gotten myself to the point where running 26.2 miles was not a daunting prospect. That is to say, I started out with a general idea that I would keep running longer and longer distances, and when I hit a point where running the full marathon distance seemed well within my grasp I would sign up for a race. Then I started talking to people about this goal. First off talking to some experienced marathoners to make sure that I wasn't just being an idiot (in general they felt that if I could make this work it was a good idea). Secondly, by describing my plan to a lot of people in my Run Dem Crew family so that they would hold me accountable. Don't underestimate the value of this step. I like to say that in one important way running is like writing: the only way to run is to run. So in general talking about running doesn't help. True. But for me talking about this goal to my running family made me feel obligated to live up to that talk. Then I started pushing my long runs. The immediate impetus for this plan was that I had signed myself up for three half-marathons in a four-week span in October of this year. My initial goal was to get myself fit enough that running a half-marathon just wasn't that big a deal. 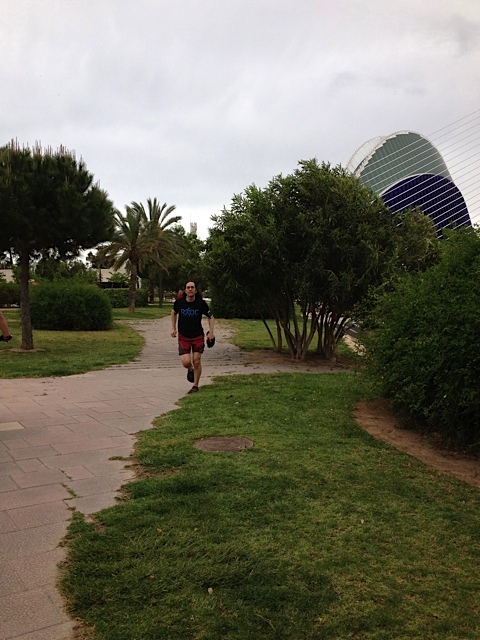 The first step was to run 22 kilometers (a half-marathon is approximately 21.1 km). I did that run on April 21st. It was tough, but not too painful. It did include notching a personal best for the half-marathon, which I felt was a fitting tribute to my friends who were running the Virgin London Marathon the next day. Then I went back to running my normal 10-11 km runs for a few weeks. On May 12th I ran for 26.0 km (16.2 miles). That run was at a much slower pace than I normally run, but did have me running for just over 2.5 hours straight. It was on that run that I discovered that I was indeed one of those people who take ice baths! I'd always thought 'no thanks, not for me' when people mentioned an ice bath. But right around mile 15 my legs started to burn and I thought 'ice bath.' This was an excellent idea. You get home after a run, fill the tub with cold water, and climb in. Yipes! Then you dump a bunch of ice in with you. Yow! And then you sit there for 10-15 minutes. Brrr! The result of this torture is that you significantly reduce post-race inflammation. Much better than taking NSAIDs! A week later (May 19th) I ran 18 km (11.2 miles) at very close to 8:00/mile. That pace would have put me at a sub 1:50:00 half-marathon, much faster than my current personal best. A good indication that these long runs are taking effect! At this point I started getting tweets from people asking when I was going to sign up for a marathon. For my next long run on May 31st I set out to run twenty miles. But I didn't have a training plan telling me that this was the day that I had to run twenty miles. I didn't have a race looming over me making me fret about sticking to that training plan. I just left the house and gave it a go. Which mean that when my legs told me to quit at 18.9 miles, I called it a day. No need to push myself too hard. No need to risk injury. The point of the run was to have a fun run. And when the run became more painful then fun, I called it quits. Headed home, had another ice bath. And you can see the results of my having perhaps pushed a bit too hard in my next couple of runs. I ran shorter distances than usual, and much slower times. But a week later I was able to run a sub fifity minute 10k. And two weeks later, on June 15th, I was able to complete that twenty mile run. At which point I knew that I could run a marathon, but that I wasn't there just yet. I started looking at possible marathons to run, and kept encountering scheduling issues. Or race lottery issues. Sure it would be great to have my first marathon be London 2013, and I did put my name into the ballot. But it's unlikely I will get a place, so I needed a plan B. And truthfully I didn't want to have to wait until April, I'm feeling close to ready now. But all my searching came up with nothing but complications. Races were too far away, in extreme weather, too far into the future, etc. The one race that really seemed to make sense was Amsterdam. I was already planning on being there to run the half marathon, the timing was excellent as I would have nearly four months to get my distance up to 26.2 miles, and I would likely have a lot of friends (not to mention Suzanne) there to support me. Just one problem. One week after Amsterdam I am committed to running the Run to the Beat half-marathon. And that's supposed to be a tough, hilly course. I kept thinking that it was just crazy. But then I did a couple of runs, including running with the Run Dem Crew Cheetahs that week after running 20 miles, and I hatched a plan. Exactly one week after running 20 miles I took the tube out to North Greenwich and set off to run the RTTB course. And I told people that this was my fitness test. If I could run that course one week after the long run, then I could run that course one week after running a marathon four months from now. It's not the most scenic course, and it sure is hilly. But the hills were not as bad as I had anticipated, and I finished my 13.1 mile run in under two hours! The only issue was that my left knee was a bit sore near the end of the run, and continued to be sore after the run. But as I thought back over the race I realised that this was most likely the result of taking a big downhill too fast and losing my running form in the process. When I had corrected my gait for the end of the run I had felt fine. I also realised that I had run close to seventy miles in a two week period. Which is a lot when your typical week is closer to 25-30! So I took three days off. Again, no training plan to tell me otherwise (oh, and no training plan to tell me not to run more miles than I could handle, oops). Just did what my body told me to do. And after those three days went off to run with my Cheetah compatriots and felt fine. Not 100%, but close. And no problem maintaining a good pace. And the plan for the next couple of weeks is to focus on preparation for the British 10k, so no long runs for a little while anyway. During this three day break from running I became quite aware of something which I suspect sets me apart from a lot of other people. I kept asking when did I get to go on my next long run. Not 'have' to go. 'Get' to go. the truth is, I like long runs. I've known this for a while, but it becomes more and more apparent the more I do them. I look forward to pushing myself to longer distances. I know a lot of people doing marathon training hate the long runs. Dread the long runs. Fear the long runs. Not me. I relish them. Next run the plan will be to try for 23.1 miles. That's, midway between 20 miles and the full marathon distance. If all goes well, the run after that will be the full marathon distance. Which means that when I line up to run a marathon for real, I will know that I am capable of running the distance. I am now signed up to run the Amsterdam Marathon. And when I line up for it I expect to be ready. I won't have followed any training plan, but I will have done lots of long runs. And when I finish it, I hope to still be happy at the idea of running another marathon soon. This page contains a single entry by Daniel Maskit published on June 27, 2012 12:09 PM. Baking Bupa 10K was the previous entry in this blog. Proper British 10k is the next entry in this blog.